Plants reach from 30 to 90 cm in height. They carry small flowers of red, pink, yellow or white that are reminiscent of tiny lilies. 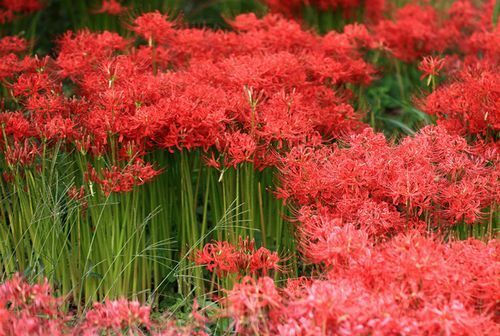 Some of the common names for Lycoris include Hardy Amaryllis, Spider Lily and magic Lily. Lycoris radiata, Red Spider Lily flower photographs by TANAKA Juuyoh (田中十洋). Common Names: Cluster Amaryllis, Hurricane Lily, Magic Lily, Spider Lily, Stone Garlic. Flower Details: White, red, pink, orange, yellow. Lily-like. Umbel; four to eight flowers. Grow Outside: Usually grown from bulbs or vegetatively propagated plants as seed grown plants can take up to 12 years to bloom. Bulbs: 3 to 8 inches (8 to 20 cm) depending upon species. End of summer. Seeds: Cover. Late summer or autumn; use fresh seed. Seeds should first be sown into flats. Next sink the flat into the ground in an area that offers shade, preferably close to a wall that faces north. Provide a glass/plastic covering. Keep an eye on the flats to ensure that the soil remains moist and to check if seedlings have emerged. Transplant the seedlings to their final location at the start of autumn. Requirements and care: Full sunlight or partial shade. Good drainage. Acidic to neutral soil. Rich soil, moist soil. Regular watering to maintain soil moisture. Requires a feed every two years; do this during the growing season. Propagate: by planting bulblets once blooming has finished. 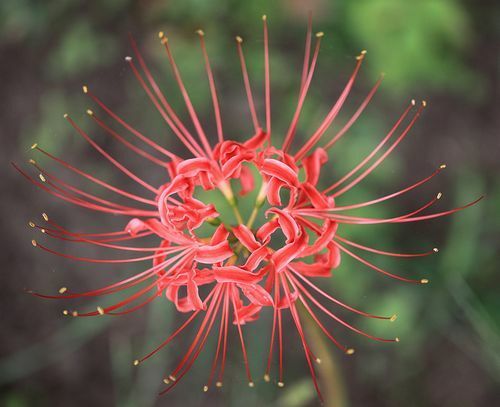 Miscellaneous: In Japanese legends’ if someone meets someone that they will never see again then Lycoris will flower along the path that they take. Hardy Amaryllis and other Lycoris members can be grown from bulbs or seeds. The bulbs should be burried at a depth of 10 cm (small Lycoris species) or 15 to 20 cm (larger varieties) at the start of august. Seeds should be sown fresh into flats, at the end of summer or beginning of autumn in a shady location; once sown lightly cover Lycoris seeds with soil then cover the flats with glass. Lycoris can grow in either partially shaded or sunny parts of the garden that has good drainage. They like to grow in a soil that is rich, moist and as a slightly acidic to neutral pH. It is best to allow the seedlings to grow for a year until they have formed bulbs, then transplant them about 10 cm apart (small) to 40 cm apart (large Lycoris species). 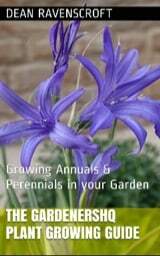 If you require more Lycoris plants in your garden then it is best to propagate from the bulblets that they produce.